This post is sponsored by the National Turkey Federation. 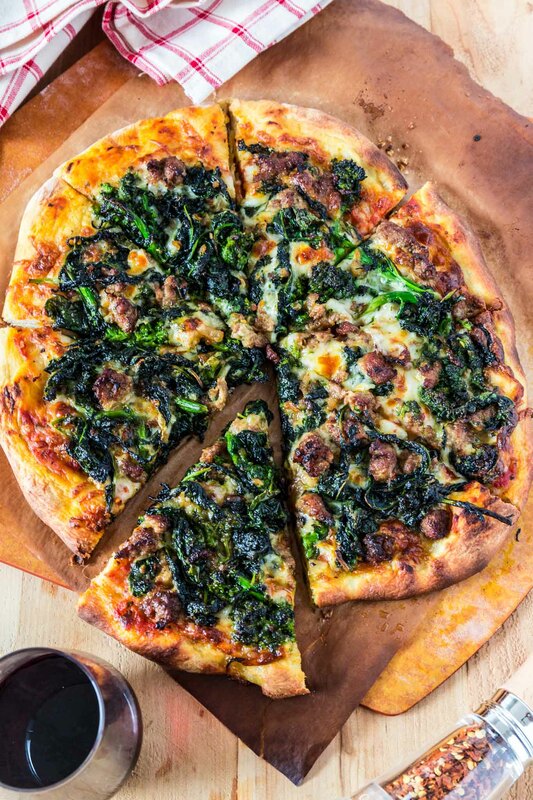 This Turkey Sausage and Broccoli Rabe Pizza is one of the best pizzas you will ever taste. 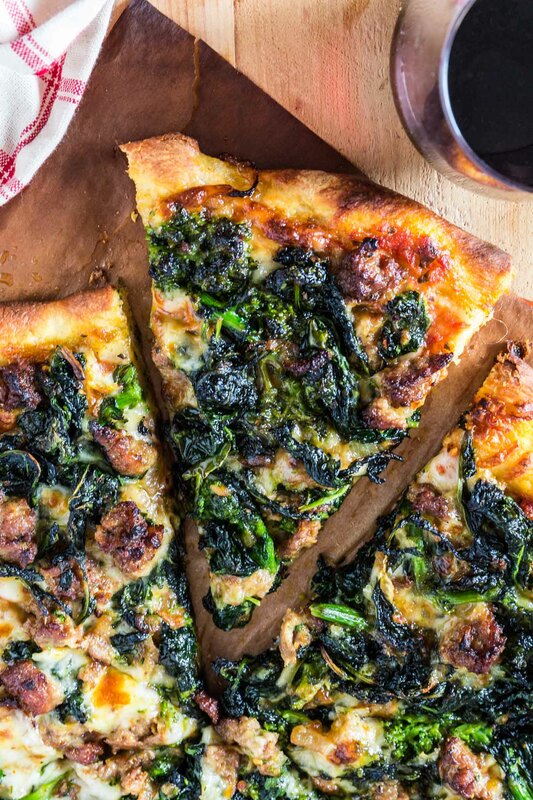 The slightly bitter and peppery broccoli rabe combined with the smokiness of the provolone cheese and the subtle sweetness from the turkey sausage create an explosion of flavor that will wow even those who turn their noses at broccoli rabe. You simply must try this! Oh, pizza, how I love thee! It has been a while since I posted a pizza recipe and I’m so happy I did it today. It is amazing how therapeutic it is to make homemade pizza! It soothes even the deepest sorrows. Truth be told, I am feeling a little disconnected from my kitchen and my cooking abilities. Maybe it’s the fact that on top of everything else, I managed to get strep throat. Yay, me! ? However, today I got in the kitchen to make this pizza and I had fun. Real, singing my lungs out (yes, even with a strep throat and hoarse vocals) fun! Gee, I can’t remember last time it happened! I had somehow forgotten how making pizza makes me happy. My inspiration for today’s pizza was a pizza I had last year in Italy called Salsiccia e Friarielli. The thing is: I hated that pizza! ??? At first, I totally regretted ordering it. But then, as I was eating it, I realized it had the potential to be something amazing. So I had in the back of my mind that I would like to play with similar flavors and see if I could get it to taste as good as I thought it would be when I first saw it on the menu. And the good news is I succeeded. 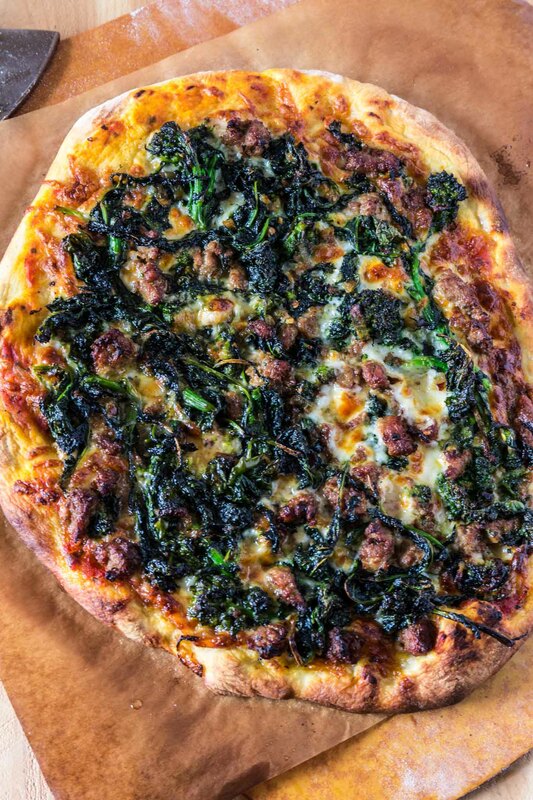 This Turkey Sausage and Broccoli Rabe Pizza definitely enters the hall of fame for creations of which I am most proud! This pizza is traditionally made with pork sausage, but I’ve been on a major turkey kick lately, so I went with turkey sausage instead. Turkey is not only delicious and versatile, but it is also naturally low in fat and provides immune-boosting nutrients like iron, zinc and potassium. It’s also packed with lean protein to keep people feeling full longer and satisfy their appetite for health and fitness. What I love the most about turkey sausages – and turkey in general – is the fact that they are especially succulent and flavorful, making it the perfect choice for this pizza. If you’ve seen any of my other pizza posts here on the blog, you know I always recommend using a pizza stone. That is the only way to get pizzeria quality pizzas at home! And they are quite affordable too. If you want to venture into making the dough from scratch, I shared my recipe a while ago and you can find it here. If you don’t want to do that, most major grocery stores sell refrigerated fresh pizza dough. Just make sure to bring it to room temperature before attempting to shape your pizza. And that’s it for today, my friends. 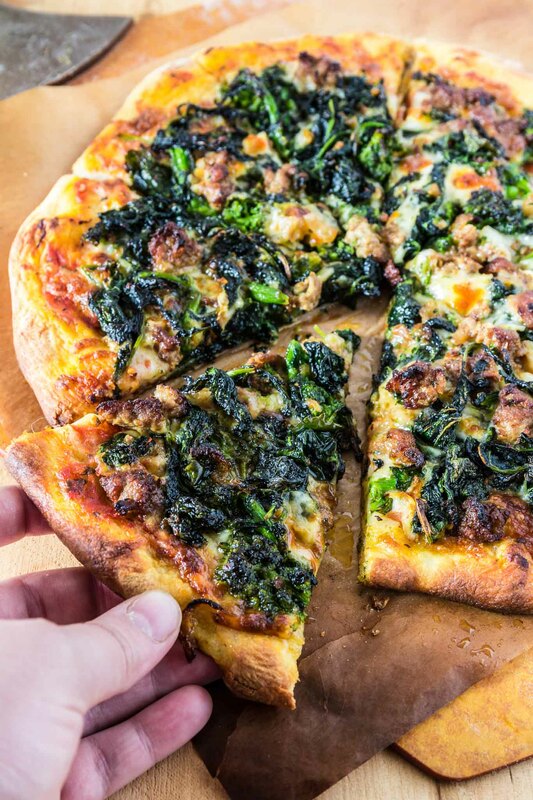 If you’re a broccoli rabe pizza lover, you gotta give this version a try. The turkey sausage and smoked provolone really bring it up a notch! But if broccoli rabe is not your thing, maybe this pizza is what’s going to change you from a broccoli rabe hater into a broccoli rabe lover. Oh, I just know it will! ? Preheat your oven to 550F (or as high as it will go). In a large sauté pan, over medium heat, heat the olive oil and add the onions. Cook until they begin to brown, about 10 minutes. Then, add the garlic and red pepper flakes and cook until fragrant, for just a few seconds. Add the sausage and cook, breaking it up with a wooden spoon, until browned, about 6 to 8 minutes. Mix in the broccoli rabe, season with salt and pepper and cook, stirring frequently, until tender and wilted, about 5 minutes. If there's any liquid in the bottom of the pan, continue cooking until it evaporates. Remove the pan from the heat and reserve so the mixture cools to room temperature. Roll the pizza dough into an 18-inch to 20-inch round (or two smaller rounds if you want two pizzas). Transfer to a floured pizza peel (I usually use parchment paper on top of the pizza peel for convenience). Then, drizzle some olive oil and season the pizza dough with salt and freshly ground pepper. Top with the pizza sauce, the mozzarella cheese, the provolone cheese and, finally, the broccoli rabe/sausage mixture. Transfer the pizza to the oven (ideally to a pizza stone) and bake until the pizza is crisp and golden brown and the cheese is melted, about 6 to 8 minutes. Drizzle the pizza with truffle oil, if using, and serve. Mmmmm, got hooked by your introduction :-) Thank you so much !